Note: This review contains spoilers from the previous two titles. If you have not read the previous books, read this review at your risk. Gikany and Una have come to appreciate the compelling world of The Farm series. The unique vampire mythology is fascinating. Humans already possess the DNA that can turn us from thinking beings into ticks consumed by only the hunt and need for blood. That this potential can be made a reality through a catalyst created by human scientists is staggering. The previous two novels, The Farm and The Lair, have led to this final resolution: the search for the cure. Does it exist? Will it actually work? But most importantly, what are the consequences using the cure on the tick? As the novel begins, Carter and Mel are forced to split up to try to save Lily. Carter returned to base camp to get help obtaining a sample of the cure from the vampire Sabrina. Meanwhile, Mel returned to El Dorado to hopefully find Sebastian and use him to open his impregnable vault. However, nothing in this novel was as simple or clear cut as it seemed. The end of the novel nicely tied everything up with a big bow. We enjoyed how the story came full circle and the hope we were left with. Despite that, we still wonder what happens next. The world isn’t fixed, but there is hope that it can heal. However, with nothing on the author’s website alluding to future novels, it seems like this is the last novel. After experiencing so much heartbreak and tension through the series, it was really wonderful to have that sense of hope and happiness at the end. Gikany and Una are not fond of multiple points of view when utilized in first person narration. 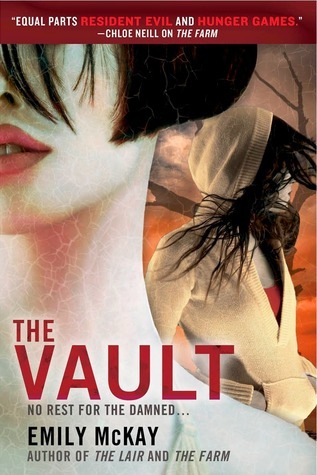 The Vault is told from the viewpoints of all three main characters. This is a chapter from Mel, then a chapter from Lily, a few from Carter, then one from each, and so on. The constant starting and stopping interrupted the flow of the story for us, especially as the story bounced from once location and situation to another. To add to the roughness of the rhythm of the story, Carter and Lily’s perspectives are in past tense while Mel perspective uses present tense adding to the confusion as the story transitioned from one narrator to the next. In our opinion, it would make the story flow more smoothly if the author had told the story in the third person. All in all, The Vault is a compelling and hopeful conclusion to this journey. We are not sure what happens next, if anything. The world is still not finished and we hope for more in it. Despite the choppy narration, this young adult series is fascinating and enjoyable. Hm… I have been on the fence with this series but I do like the sound of the characters. I mean how could you not like a character named Mel? 🙂 Might wait until they are all out and binge read. That’s the thing… the world, the characters, the storyline is all great. But the execution of using multiple points of view and within that different narratives was disruptive to the flow, in our opinion. However, that is just our bias, you might like the format. I’d say give it a go and I hope you enjoy it!